Having twice played in the PGA Cup, Mike Steadman has won the GB & I Club Professionals Championship and been a European Tour Player. Mike brings a lifetime of golfing experience to the tuition. 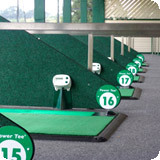 Lessons are available all day from Tuesday - Saturday, Tues and Thurs evenings. 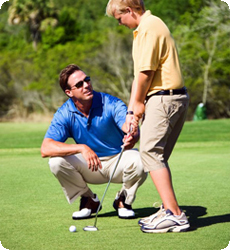 Saturday morning Junior lessons are available; the lessons include a bucket of balls, a round on the pitch and putt for just £3. Lessons can be on a ad hoc basis or a course of 6 purchased with 1 free. Group lessons can be tailored to suit also we run group lessons at the Centre for Community Education, so we would hope to be able to fulfil or your requirements: Bunkers, Chipping, Putting, Driving, Iron’s, Etiquette, Rules are just some of the aspects we cover.